At 11.40pm on 14 April, 1912, the famously 'unsinkable' ocean liner, Titanic, struck an iceberg. Two hours and 40 minutes later she sank deep into the freezing Atlantic waters. Less than a third of the people on board survived. Over the years, the BBC has heard from some of the men and women who lived through that 'night to remember'. Their memories, and internal BBC documents about the controversies that followed, are now gathered together to tell the true story of the disaster. Commander Lightoller was the second mate on board the RMS Titanic, and the most senior officer to survive the disaster. Lightoller was decorated for gallantry as a naval officer in the First World War and later, in retirement, further distinguished himself in the Second World War by providing and sailing one of the "little ships" during the perilous Dunkirk evacuation. In this film 'The Titanic Disaster' Lightoller gives his version of events on the fateful night in April 1912. He lays great weight on the fact that a warning message about the amount of ice in the area was never delivered to the bridge, seeming to imply that if this news had been received, the accident could have been avoided. Carpathia took three days to reach New York after leaving the scene of the disaster. It should have been much sooner but the journey was slowed by pack ice, fog, thunderstorms and rough seas. However, the Carpathia was able to pass news to the outside world by wireless about what had happened. Unfortunately the initial reports were confused, leading the American press to mistakenly report on the 15th April that Titanic was being towed to port by the SS Virginian. Later that day, confirmation arrived that Titanic had been lost and that most of her passengers and crew had died. This terrible news attracted crowds of people to the White Star Line's offices in London, New York, Southampton, Liverpool and Belfast. It hit hardest in Southampton, whose people suffered the greatest losses from the sinking. According to the Hampshire Chronicle on 20 April 1912, almost 1,000 local families were directly affected. Furthermore, almost every street in the Chapel district of the town lost more than one resident and over 500 households lost a member. 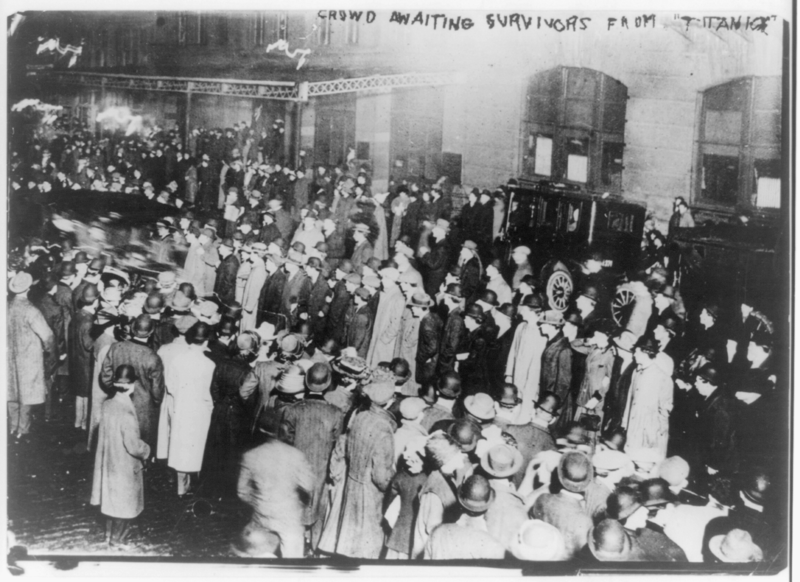 It was not until 17 April that the first incomplete lists of survivors came through, delayed by poor communications. The Carpathia docked at 9.30 pm on 18 April at New York's Pier 54, and was greeted by some 40,000 people waiting at the quayside in heavy rain. Many of Titanic's surviving passengers did not hang around in New York but immediately headed onwards to relatives' homes. 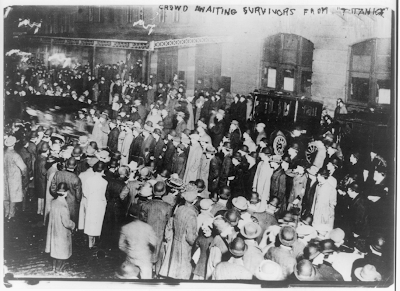 Some of the wealthier survivors chartered private trains to take them home, and the Pennsylvania Railroad laid on a special train free of charge to take survivors to Philadelphia. Titanic's 214 surviving crew members were taken to the Red Star Line's steamer SS Lapland, where they were accommodated in passenger cabins. Carpathia was then hurriedly restocked with food and provisions before resuming her journey to Fiume, Austria-Hungary. Her crew were given a bonus of a month's wages by Cunard as a reward for their actions, and some of Titanic's passengers joined together to give them an additional bonus of nearly £900 (£66,038 today), which was divided between the crew members. The sinking of the RMS Titanic was one of the most dramatic events of the twentieth century. In a mere four hours after striking an iceberg, the largest passenger ship so far built sank while on its maiden voyage, and claimed the lives of over 1,500 persons. Many of those lost were from the upper crust of British and American society. The sinking of the Titanic, which had been popularly regarded as unsinkable, put doubt in the belief that modern man had dominance and control over nature, a mistaken belief that had grown out of the Industrial Revolution and the Progressive Era.